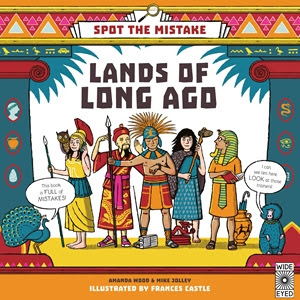 Spot the Mistake: Lands of Long Ago is a children’s picture book by AJ Wood and Mike Jolley, illustrated by Frances Castle, and published by Quarto Group UK (Allen and Unwin in Australia) 2017. RRP: $Au 24.99 HB. Would an Inca warrior have ridden a camel? Would a Viking have listened to his radio? Test your knowledge of history and spot 20 mistakes in every scene from ancient civilisations, then turn to the back where you’ll find the answers and more fun facts about ancient civilisations, including the Ancient Greeks, the Ancient Egyptians, the Romans, the Mayans, the Vikings, and many more! For ages 7-10. I don’t think I’ve ever met a child who didn’t love a puzzle book! What a wonderful idea to combine visual puzzles with history - kids can test their knowledge of history by identifying anachronisms and other mistakes, and perhaps use any of the double-page spreads as a jumping off point for further study. There are 20 mistakes to spot in each scene, then clear explanations are given that kids will understand. The time periods covered go from the Stone Age, Ancient Greece and Rome, the Mayans, all the way through to the pirates who operated in the 17th and 18th centuries. Castle’s illustrations are colourful and attractive. Most importantly, they make the mistakes look an everyday part of each scene which will appeal to kids who like to be challenged. This robust book will stand up to the repeated re-readings it will no doubt get - an excellent choice for libraries everywhere, but also a great coffee table book for home.